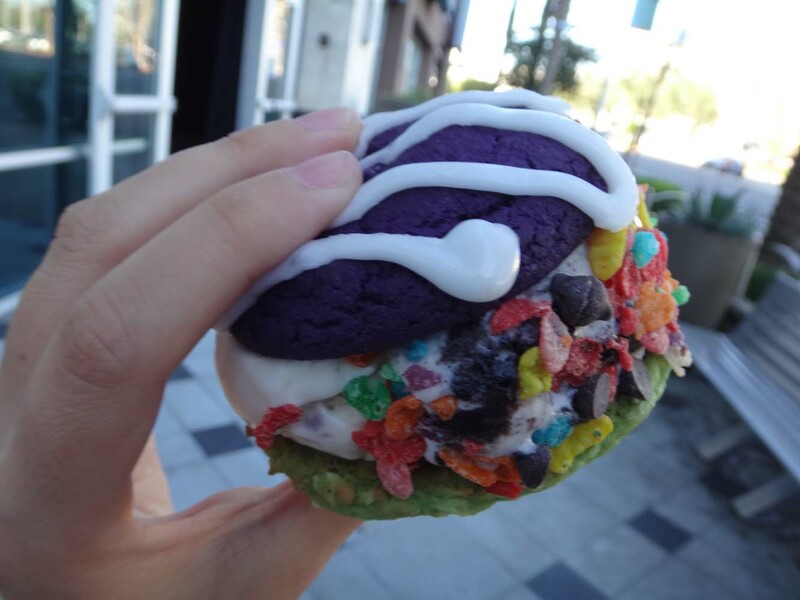 Treat Yo`Self with Exotic Cookies such as Ube, Thai Coconut and More! @ Inside Skup - Fullerton - EAT WITH HOP! 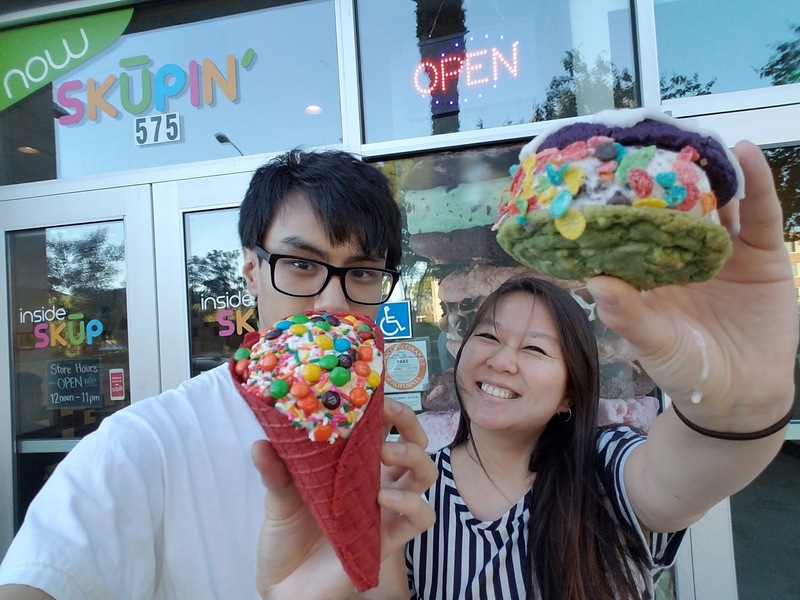 Here is Kevin holding out his ice cream covered in lots of toppings all inside a RED VELVET CONE! YAAAAAAAS! DESSERTS! BECAUSE WE DESSERT THIS...!! 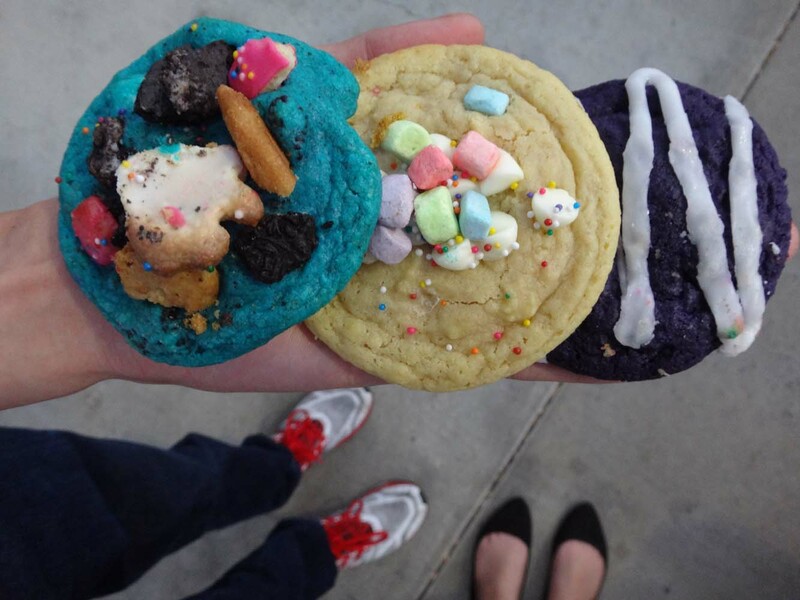 From Left to Right: Cookie Monster Cookie, Lucky Charms Cookie, Ube Cookie! SO HERE IS THE INSIDE SKUP! Kevin and I are regulars at Inside Skup! 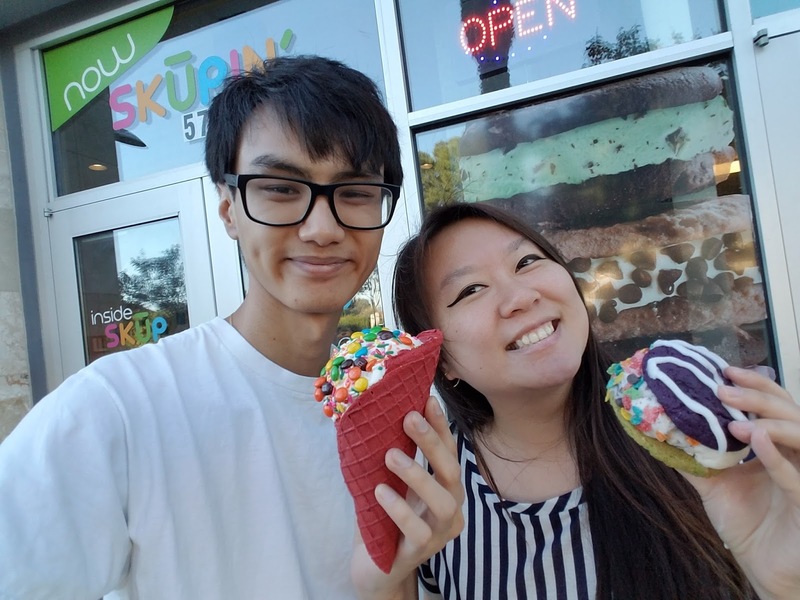 Since he attends CSUF, during breaks we like to walk over to Inside Skup to satisfy our dessert cravings! 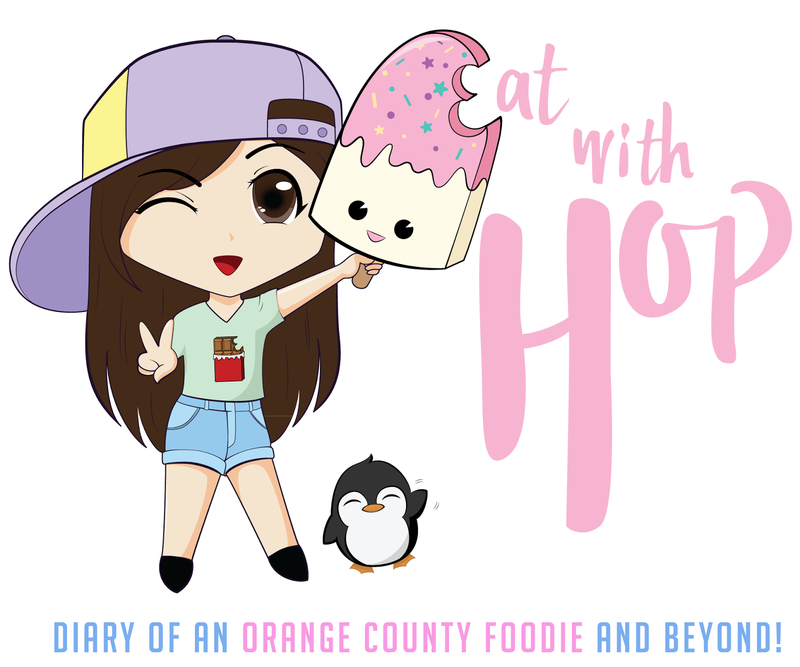 We are often lured here through them good `ole E-Foodie Deals (y'all need to check it out!) and get ice cream sandwiches for only $3 (og price is $5)! As you know already, I love deals so we feel like we savin` tons since I like to indulge in ice cream and cookies. I love how Inside Skup is innovative with their cookies! They once debuted the pho cookie and for those who dared to try it (like me), they would realize that the baker's skill is incredible! How could she make such an accurate pho tasting cookie??!! Bring it back please! Because I actually liked it! 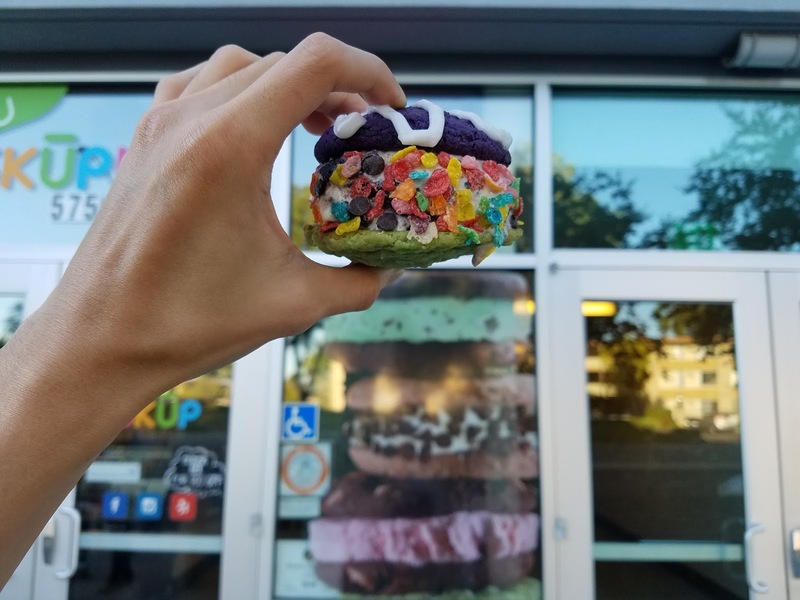 Cookie Dough ice cream + Oreo ice cream sandwiched between an Ube cookie + Thai Coconut Cookie! I love these two cookies! 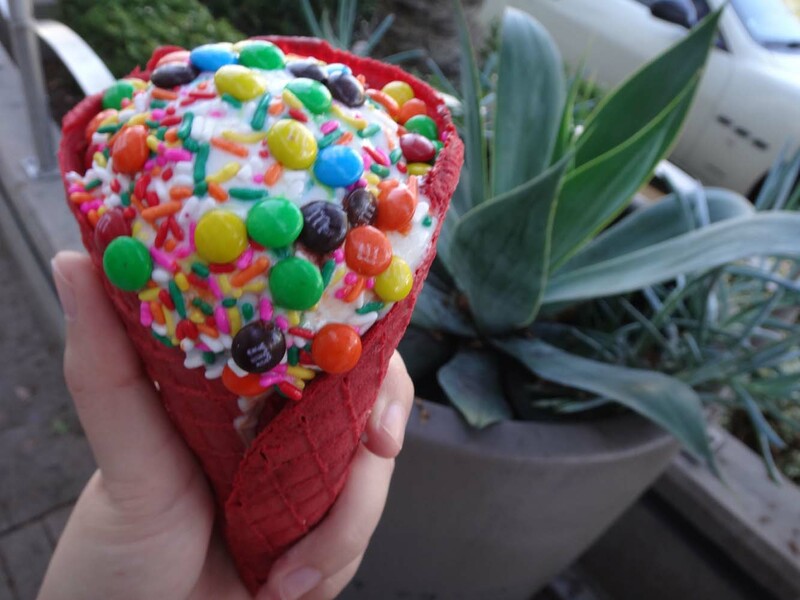 Strawberry Cheesecake ice cream inside a Red Velvet cone! 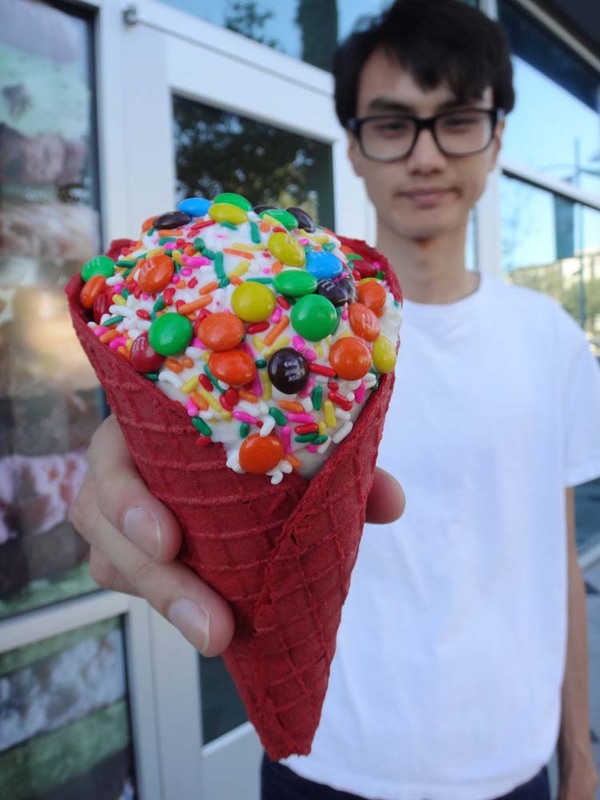 Red Velvet cone was sort of mushy and soft. Not exactly the crunchy type of waffle cone. It definitely did taste like red velvet though! faves were the ube, thai, and pumpkin! So I don't find the ice cream here mindblowing or anything. 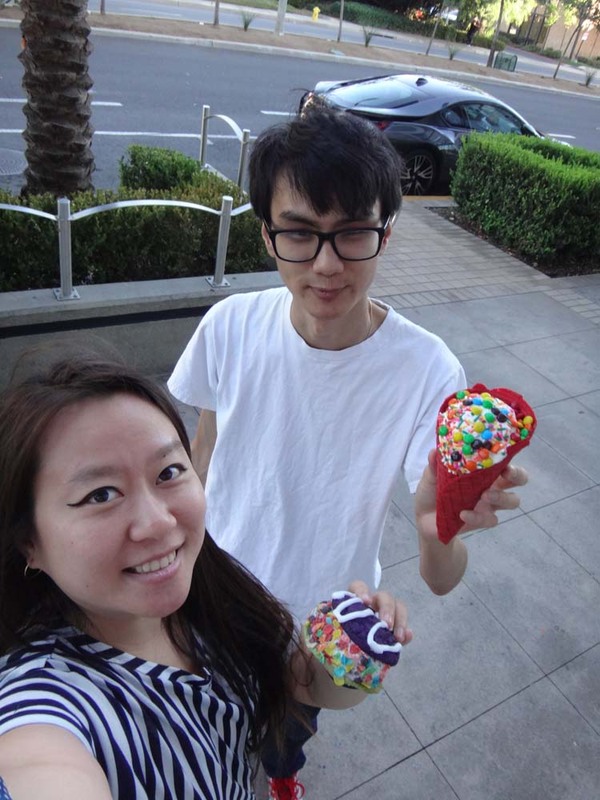 They order / buy their ice cream from some company (they don't make their own ice cream). I do applaud them for having unique flavors such as Thai Tea and Ube though! Now, just because their ice cream is so so doesn't mean doesn't mean it's bad. 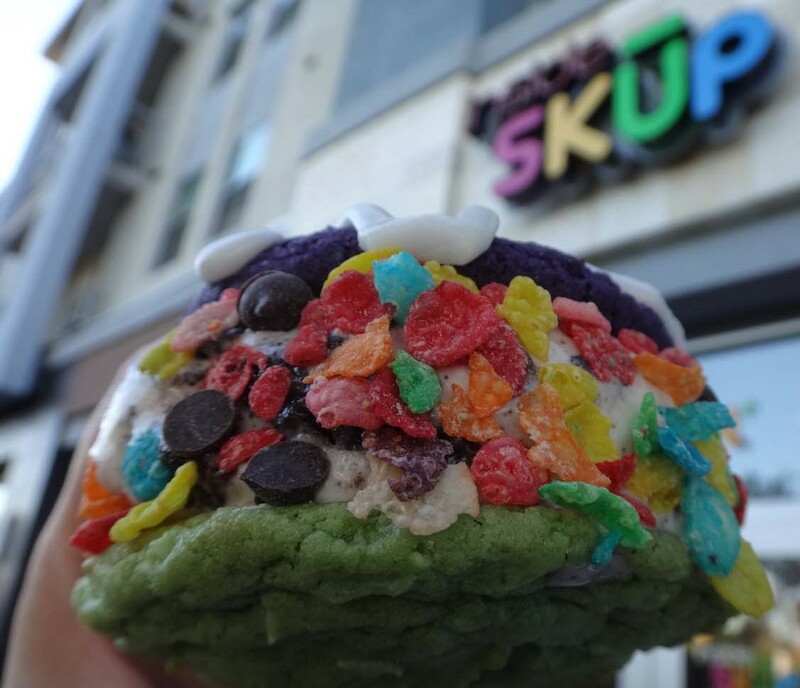 Inside Skup specializes in baking their own cookies and here's where they shine. When I first came here I fell in love with their cookies. So much so that I would buy dozens and even have cravings for them! That's how good they were! My favorite was the Captain Crunch Peanut Butter which they no longer make. They have since then updated this Captain Crunch cookie to different versions. Versions that made it more appealing and insta-worthy but less tasty. Less like Captain Crunch.... They also had some other very daring flavors that they stopped doing. Maybe it didn't sell well? 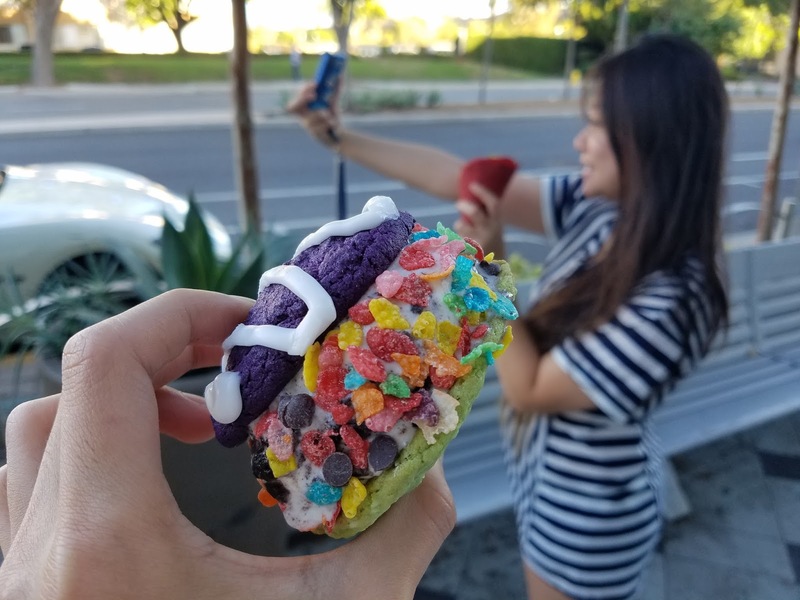 But they still kept the other popular ones such as Ube, Thai Coconut, Nutella and seem to be making more "insta-worthy" cookies such as Cookie Monster and Lucky Charms. Well, it seems like more insta-worthy because those cookies have a lot more color and people on the `gram love color. Pricing. They have messed around with the pricing to the point that I don't agree. Which is why I only go here when there is a deal. Let's just say I first thought of Snow Monster / Diddy Riese / Stacked when I came here. It's just another ice cream sandwich shop except parking is a hassle. Only convenient if you happen to be in the area. They do validate 1 hour parking though. Before, they used to discount their cookies if you ordered by the dozen. If you only order a few it'd be $1 each but say... you order a dozen then it's $10. Hell yea I'm gonna order a dozen because there is incentive to. Now, I don't care too much to order a lot because it's gonna be the same price either way. They have improved on their flavored cone texture. Yay! So I was excited to try their flavored cones when they first debuted. 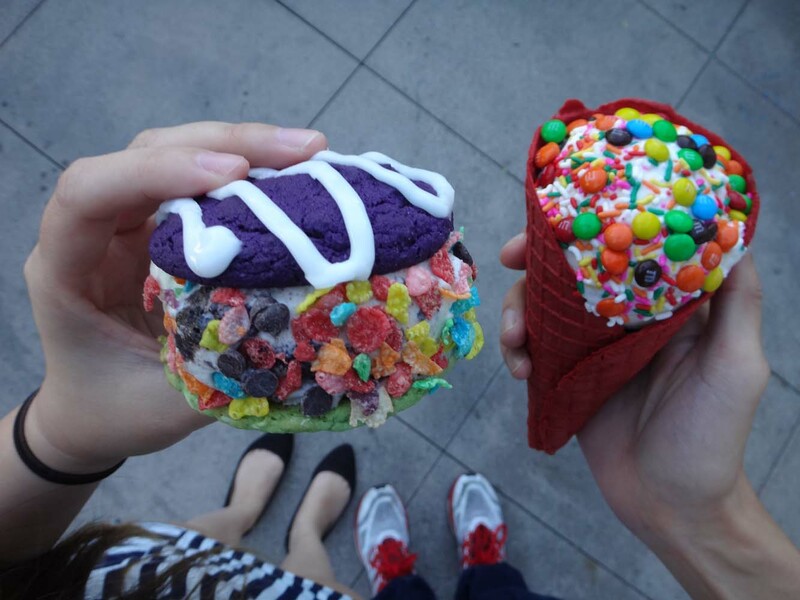 I had the Ube Cone and it was a fail T__T. I'm happy they tried but the first time it was just.... very thin and too crispy so basically it would not stay intact. 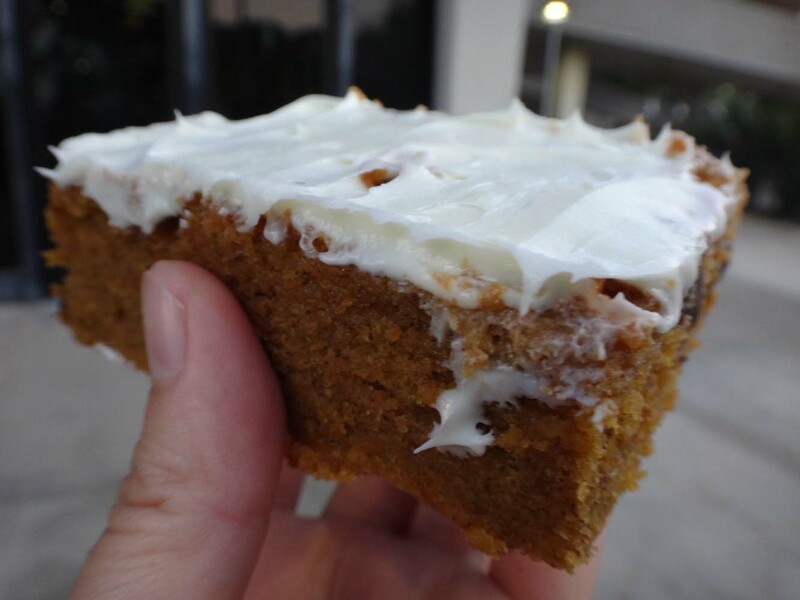 It would just crumble with every bite and our dessert became super messy. But from tasting their Red Velvet Cone this time, it's much thicker and more intact! Yay! No more falling apart on me! Overall, I'd definitely go here to buy their cookies. I wouldn't per se buy their ice cream sandwiches unless I'm in the mood for it. But I think their star product is definitely their cookies! I love how fresh they taste, how soft and moist they are, and of course how unique they are! $1 ain't so bad for unique freshly baked cookies!